The recent trip to Dartmoor had left me itching for more. It was not a case of if or when but of how to approach the return. Sometimes the scattergun, close-your-eyes-and-point-the-finger method is required. On this occasion I thought I would try being methodical (for once.) By exploring an adjoining piece of the puzzle would I not gain a clearer understanding of the whole? Of course, as soon as we arrived, a sense of de ja vu prevailed. The piece I had chosen seemed to have riddles and puzzles of its own and a variety of different habitats to explore. From the car park at Cold East Cross, we crossed the road and set out, uphill and into the unkown. It was windy and the condensed banks of cloud seemed set to invest our efforts with showers. There were black slugs in abundance on the ground, their treacly, glossy bodies stretching over the peaty ground in anticipation. Carpets of stonecrops graced the rocks of our descent. 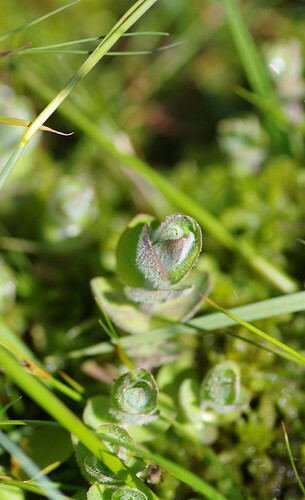 Further down, they mingled with Heath Bedstraw and base layers of sphagnum mosses. We made a gap through the gorse bushes and came to a patch of grassland where Heath Speedwells dominated but would not stay still in the breeze. On the left we took a rocky public bridleway and wandered down to a stream, labelled Ruddycleave Water on my OS map. It was the sort of path that looked ancient. I wonder how many farmers and drovers, pilgrims and latterly, ramblers have gone along it over the centuries. Running water dribbled down its course and near the bottom, among the mossy stone wall, we thought we had found the uncommon Little-robin. It turned out to be the more familiar Herb Robert. Past the farmstead named Bowden we headed back up to moorland via a track road. 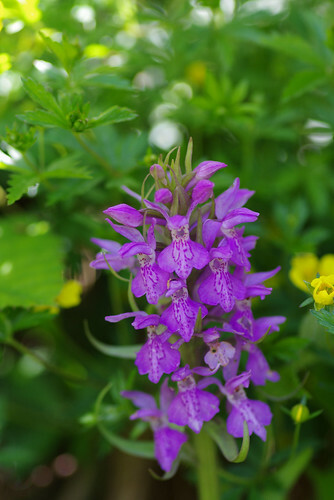 Near the top, there were pink orchids at the base of the hedgerow and over a metal stile, white butterfly orchids in a wild flower meadow. The flowers of this orchid bear a startling similarity to the Southern Marsh-orchid drawing in my field guide. 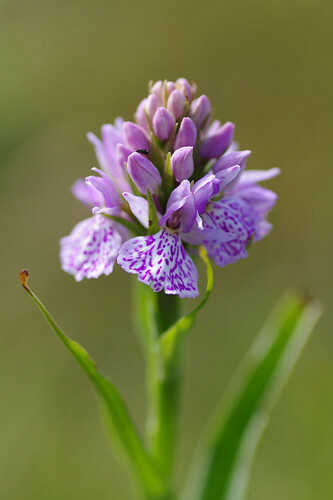 Then again, it could also be an example of an Early Marsh-orchid (subspecies pulchella) because the bracts poking out of the stem like reptilian tongues are slightly purple-tinged. Orchids are notoriously difficult to identify and are capable of giving even experienced botanists a headache. They hybridise freely and some species (like the Early Marsh variety) have subspecies to make identification even more elusive. I'm also frequently inclined to wonder how marvellously they have evolved. Why have the different species developed in the shape of a bee, a man, a lady, a frog etc? Is this an elaborate ploy to attract bees? 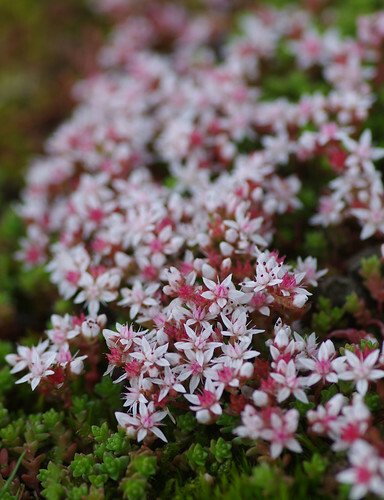 Different specimens of the same species often appear extremely variable - as if the flowers are unique, like faces in a crowd. At length, we left buzzing bees, mating hairy chafer beetles, and this world of floral confusion, behind. We followed the path intersecting Pudsham Down, and on a low grassy verge, stopped for lunch as occasional gaping-mouthed motorists passed. Then it was time for Blackslade Mire. Usually if anywhere has 'mire' attached to it then I'll avoid it like the plague. Visions of Grimpen Mire in The Hound of the Baskervilles, and ideas of the bog claiming wandering ponies will force a retreat. But there was something about the name of Blackslade Mire that drew me ever closer - even though the ground going uphill was marshy (never a good sign.) In the valley below, there was a peaceful yet atmospheric stand of pines that had verdant grass like a lawn and seemed oddly out of place. 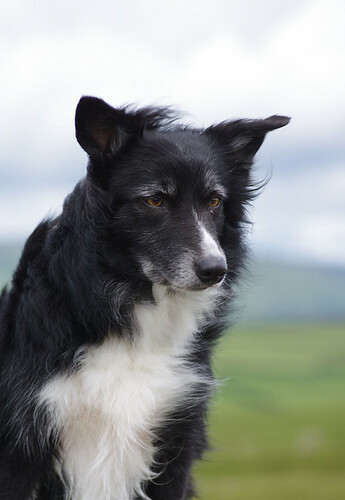 We went left and north, keeping a high path by a stone wall boundary to a field above. Then we edged lower, attracted by the wildlife just out of reach. Pearl-bordered fritillaries and a Large Red Damselfly, with a dazzling green and gold display below the eyes. Sundews tempted us, and below a big cow grazed in the deep, marshy lush stuff, and paid us, and the ground below it, no heed. Sometimes I am struck by an impulse to test the whims of fortune. If a cat has nine lives, how many chances will a wildlife enthusiast have to try his luck and come away unscathed? It's almost an imp of the perverse, comparable to the vague notion a naughty child might have: to do wrong just to see what the consequences will be. Often enough, this lapse of reason is tempered by common sense and I will reel myself back in. But the wildlife, and the burning desire to encounter new species is like a spell. In short, we got a bit boggy, washed our boots (and paws) clean at the first available stream and returned to higher ground. 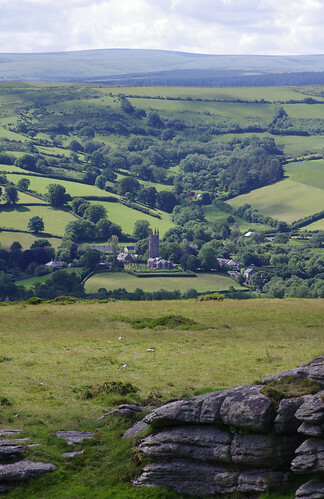 The view of Widecombe church from Pil Tor. From Pil Tor, we set a straight path to Top Tor, before arcing back to the edges of Blackslade Mire. We did not particularly wish to walk back on the road. I thought I spotted a way through the boggy stuff and then the way back almost seemed to close itself off. It felt as if we were marooned on an island. Behind us, Sherry noticed a Dartmoor pony. It was despairingly whinnying and repeatedly putting its front hooves in the air. It had to be a warning to get off the mire. We plotted our way back onto firmer land by the hardiest, less wobbly tussocks. But first there were the completely unexpected wildlife encounters: a coiled adder that showed itself briefly and was gone before the camera could capture it; a frog - well-camouflaged among the grass blades and black, peaty mosses. As I write this, the cup shape of the upper leaves will probably have been succeeded and eclipsed by stunning yellow flowers. Suffice to say, we followed the pony's advice, the pony let out a few more admonishing and then relieved noises. We retraced our steps and went up to the crossroads at Hemsworthy Gate, then headed due south along the road. Our frequent distractions off it were governed by caution and the shared feeling not to push our luck again. The specimen above is probably a Heath-spotted orchid but we dared not get any closer and were content to puzzle over it from a distance. 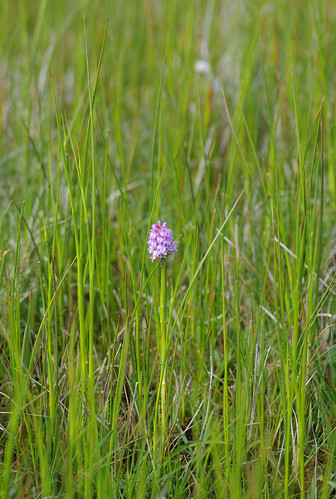 The surrounding grasses give an impression of the orchid's height. Just off the road, there were low walls of a ruined dwelling. 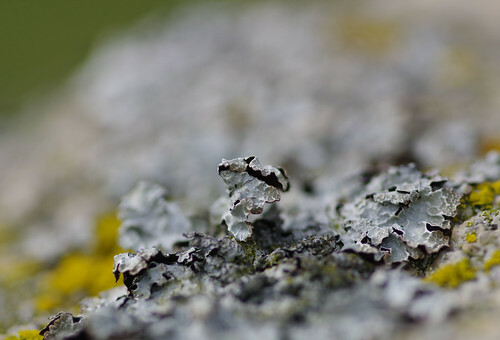 The walls were colonised by these lichens. And then we left all deviations behind and kept to the road. On the way back to Cold East Cross there was a huge black barn that looked more like a modern sculpture or art installation. Just before the car park, on some low gorse bushes, I found dodder: a strange string-like plant that strangles gorse bushes. It reminds me of the red liquorice string that used to sell for a penny in the primary school tuck shop. I hope to return soon to see it in flower. From the car park at Cold East Cross [741/743], cross the road and head roughly south west, up the hill. Keep the stone wall to your left and follow the path to Buckland Beacon. Then walk north west to the public bridleway (a corridor between two enclosed fields.) 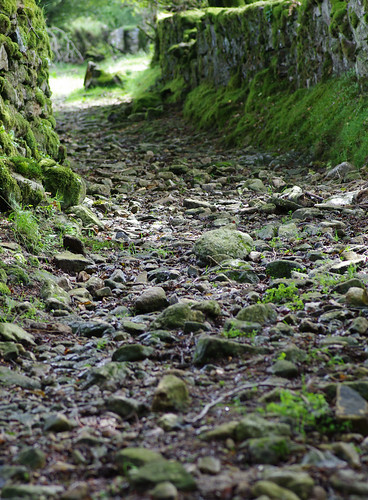 Follow the rocky path down to the stream of Ruddycleave Water, go along the track through Bowden and up the lane. At the junction, turn right and head up the hill. The lane turns to track and then a barely discernible path. Take the path roughly through the middle of enclosed fields. Then cross the road and continue roughly northwards. Keep the field boundary to your left and you will join the road. Walk straight along the road for a few yards. By the bend, turn off it by going sharply right up the hill. Again, keep close to the field wall boundary and then down the hill. Opposite the pines, turn left and keep close to the wall on your left, and away from the mire. Cross the stream, follow the path up to the left. When you have left the mire behind, veer right off the path and walk straight to Pil Tor and then straight on to Top Tor. Plot an arc back just inside the road but above the mire. Then join the B-road to Cold East Cross. For a more interesting alternative, from Hemsworthy Gate you could head south east to Rippon Tor and then aim to rejoin the road near Cold East Cross.